Note that the fuses listed below may not have all the circuits listed depending upon individual car options from the factory. Inst LPS Tach/boost gauge, illuminated trim plate, instrument cluster, LPS terminal, heater.ac control head, convenience center, radio, defogger ashtray or console light. All of the above circuits used gray wires for power supply. Cig-Clk Antenna relay, AC control head, radio capacitor, security indicator, chime module, instrument cluster (digital), radio, cigar lighter, glove box lite, engine compartment lite, footwell courtesy lites, power door locks, dome lights, trunk lites, vanity mirror lites, BAT terminal. These circuits used an orange wire for power supply. Turn B/U Gear Selector Switch and Turn Flasher. These circuits use a dark blue wire for power supply. St Blt/Acc Chime module, Defogger Control, IGN1 terminal. These circuits use a pink/black wire for power supply. ECM-Ign CCCI module, mass air sensor, ECM, ESC module. These circuits are powered by a pink/black wire. FP/Inj Oil pressure switch, fuel pump relay, fuel injectors. These circuits are powered by a pink/black wire and the injectors go from pink/black to brown after a connector. A/C Blower, Heater/AC control head, compressor clutch, trunk release switch, IGN3 terminal. These are powered by a brown wire. WDO Circuit Breaker Power windows, sun roof. These are powered by a pink wire. Stop/Haz Hazard Flasher, Brake Switch. These are powered by an orange wire. 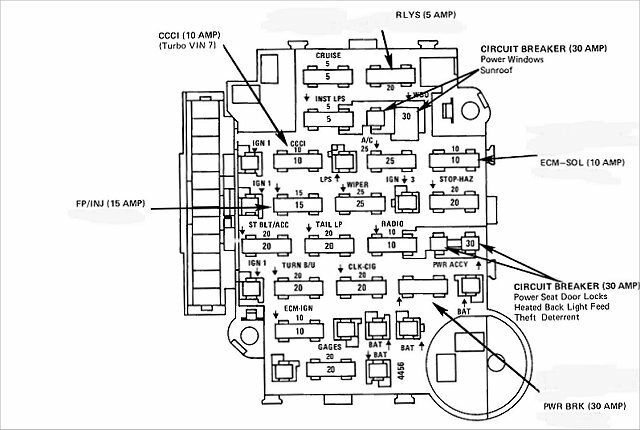 Pwr Acc Circuit Breaker Defogger control. Powered by orange/black wire. CCCI CCCI module. Powered by black/pink wire. ECM/SOL Brake switch, waste gate solenoid, canister purge solenoid, coolant fan delay relay, Electronic vacuum regulator valve, A/C cutout relay. Powered by pink/black wires. Rlys Low speed coolant relay, high speed coolant relay, Powermaster brake relay. Powered by a brown wire. Cruise Cruise switch. Powered by a blue wire. Gages Brake switch, instrument cluster (Volts light), check engine lite, VSS sensor, tach/boost. Powered by pink/black wires.